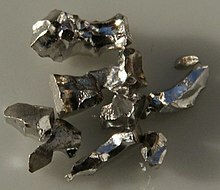 Iridium ("I-lí-ti-ùm") sī 1 ê hoà-ha̍k goân-sò͘. I ê goân-chú-hoan sī 77, hoà-ha̍k hû-hō sī Ir. ↑ Wang, Guanjun; Zhou, Mingfei; Goettel, James T.; Schrobilgen, Gary G.; Su, Jing; Li, Jun; Schlöder, Tobias; Riedel, Sebastian (2014). "Identification of an iridium-containing compound with a formal oxidation state of IX". Nature. 514: 475–477. doi:10.1038/nature13795.